The most common challenge for businesses today is maintaining an efficient supply chain. 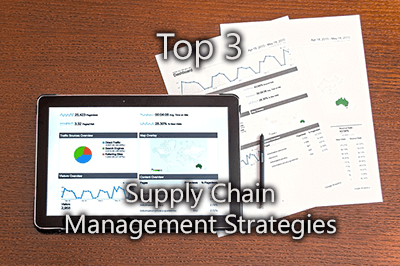 Supply chain management strategies help manufacturing companies connect the production, shipment and distribution of a product or service. When companies gain more control of inventory management, production, distribution and sales, they can easily achieve their goals. These supply chain management strategies, once put in place, can avoid storage of excess materials and inventory and help deliver products to consumers faster. Supply chain professionals must continue to adapt to this consumer demand-driven environment. With the onset of the Internet, digital operating models, and real-time analytics, companies are able to enhance their supply chain and ultimately improve their business. The goals should be to reduce inventory and logistics expenses in the short term and to shift supply chain management strategies in the long term. Utilizing effective SCM strategies help to alleviate supply chain fulfillment pressures, and allows for changes to be made easily. Companies now have the ability to view inventory in real time, so that provides end-to-end visibility from buyers and the market, to supply. Demand-driven planning models have become the industry standard and they are based on real-time insights. This model will help create a streamlined supply chain response if suppliers go out of business, or some other disaster happens which can affect manufacturing. Companies need to adapt their supply chain management strategies to better handle changing market conditions. It’s necessary to implement dynamic planning capabilities to ensure responsiveness to the ever-changing demand. Integrated execution within the supply chain results in enhanced collaboration, better visibility, more predictable sourcing, efficient manufacturing and distribution and agility. When the planet is in such distress, it’s important that profits help the planet. Companies which try to achieve sustainability can benefit from competitive advantages, like production efficiency and more customer attraction and satisfaction. Companies need to have real-time visibility, and they should conduct consistent energy analyses so they can reduce their carbon footprint, minimize energy consumption, use more recyclable materials, and optimize transportation and distribution. There are greater demands on supply chain managers to increase profitability. With these effective supply chain management strategies, there will be a better return on investment and bring on more success. In order to implement these strategies and avoid storing excess inventory in your warehouse, consider hiring help from a third-party resource like AECI. AECI is a materials management company who buys and sells surplus stock, electronic component equipment, telecom equipment, and semiconductor equipment. We can assist or advise with SCM implementation or help consolidate and sell excess inventory on your behalf. Our 3pl warehouse and fulfillment services can be customized to your needs to help you overcome any strategic warehousing and distribution challenges. We have the ideal automated solution with flexible contract arrangements, and for years, we have provided our clients with the best customer service. Contact us today to learn more about how we can help your business succeed.